STUDIO-GRADE SOUND QUALITY FOR SMARTPHONES AND CONNECTED DEVICES: JUST ADD MOJO! 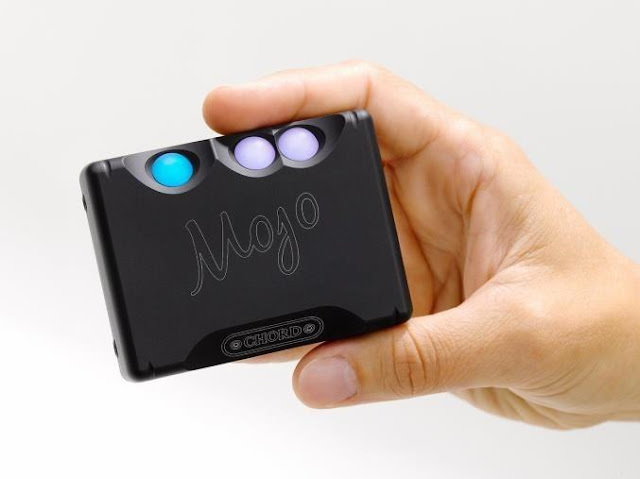 December 03, 2015: Chord Electronics, with their exclusive distributor Beyond Innovations, Inc, has launched Mojo, a British-built headphone amplifier and DAC that enables smartphones and connected devices to deliver recordingstudio sound quality from any headphone (Php 30,990). Chord Electronics, a world leader in digital audio, has launched Mojo. A contraction of ‘Mobile Joy’, Mojo is a headphone amplifier and DAC (digital-to-analogue convertor) that empowers smartphones to deliver music content at up to studio-master-tape quality. Mojo enables this due to Chord’s advanced proprietary digital signal processing technology. Low-cost, widely available apps, such as Onkyo’s HF player (iOS and Android), now make high-resolution music file playback easy from all smartphones. Mojo connects to these devices digitally, processing the files using the most advanced conversion technology available, to deliver genuinely unrivalled sound quality to up to two pairs of headphones. Mojo is entirely designed and manufactured in England using British expertise. It distils 27 years of high-performance audio know-how into a single mass-market device designed to empower the smartphone. Mojo is the most advanced device of its kind in the world. Mojo connects digitally to smartphones and similar devices in a number of ways. It offers three different high-resolution digital inputs: Micro USB, optical and a 3.5mm coaxial input. Input selection is fully automatic: if more than one input is active, they are prioritized as USB first, coaxial second and optical third. A Micro USB to USB cable is supplied with each Mojo and Chord Electronics will be offering consumers a range of approved, low-cost connecting cables for iOS devices and various other digital connections. Mojo utilises new high-temperature battery technology, giving much faster charging (up totwenty hours’ faster than competitor units). A full charge is reached in just four hours via USB, giving around ten hours’ playback; Mojo's charging Micro USB port has a battery status and charging indicator light, too. 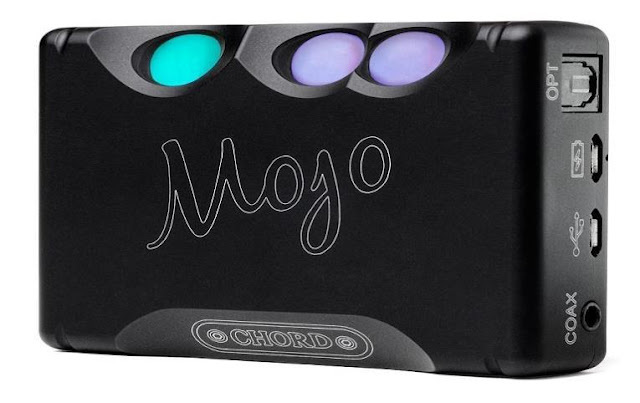 Mojo’s ultra-compact form, based on Chord’s award-winning Hugo platform, has been designed to be easily operated with no confusing or superfluous switches. Its simplicity means anyone can enjoy high-end sound quality straight out of the box. Mojo's casework is machined from solid aircraft-grade aluminium and has a hard, fine Matt-black finish that does not finger-mark. Mojo uses the new Artix-7 FPGA chipset from Silicon Valley’s Xilinx, making Mojo the most dvanced DAC of its type on the planet! Unlike other audio products, that process digital files using crude off-the-shelf chips from Asia, Chord uses an FPGA — a programmable circuit that enables its skilled engineers to directly implement its own digital audio expertise, making Mojo unique in the marketplace. Mojo uses spherical buttons for power on/off, volume control and file frequency information. The spheres illuminate and cycle through a range of rainbow colours. The file 4 frequency is shown clearly by an indicator colour option on the power switch: from CDquality (44.1kHz, red), 48kHz (orange) and so on, up through a rainbow of colours to bright white for DSD. Volume levels are similarly represented using colour. Chord Electronics Ltd is a world-leading manufacturer of high-performance hi-fi and audio products. Since 1989, from its spectacular riverside base in Kent, England, Chord Electronics has been creating some of the planet’s finest hi-fi, home cinema and professional audio equipment. A technology-driven innovator, Chord Electronics continues to deliver excellence through exemplary audio engineering, cutting-edge design and a true aesthetic understanding. With over 15 years and numerous brands under our name, Beyond Innovations Inc. has become the market leader and one of the most well-respected audio-video systems provider in the industry. We specialize in giving total audio-video solutions via distribution and sales through stores and retail channels for both home and commercial use. To date, our company is the exclusive Philippine distributor of audio's most respected brands such as AKG, Boston Acoustics, Chord, Denon, Harman Kardon, Infinity, ITC, JBL, Lexicon, Mark Levinson, Revel, Optoma, Q Acoustics. We are also the largest distributor in Asia for Control 4 (Home Automation). Mobile joy...Mojo, now that's creative. Bet my husband would love this! such investment tlaga milton, i personally tried it myself, iba ung tunog, feel na feel mo yung instruments. You must like all these products. Thanks for sharing.